Acela Express rounds a curve in Connecticut. Shown is the trailing power car of a southbound Acela Express and the front of a northbound Metro-North railcar. Most definitions of technical debt require that the asset bearing the debt be software. From the policymaker’s perspective, this requirement is rather limiting. So for the purposes of this blog, I define technical debt as any property of a technological asset that we would like to revise, replace, or create, and which limits the ability of the enterprise to gain or maintain a dominant market leadership position. Consider an example from the railroad industry. 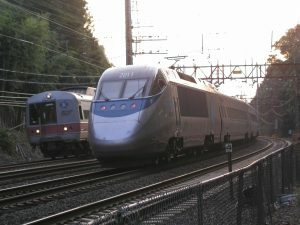 In the United States, the highest-speed rail line is Acela Express, which travels in the northeast corridor between Boston and Washington, D.C. Parts of the right-of-way, track, and catenary it uses were not originally designed for this application, and therefore trains cannot operate at their highest possible speed [Maloney 2000]. On the 231-mile section from Boston to New York’s Penn Station, Acela achieves an average speed of only 63 mph (101 km/h), even though the trains can operate safely on straight track at 150 mph (240 km/h). Yet, Acela still manages to capture a 54% share of the total air and rail market between these two cities. That 54% share might be higher still if not for technical debt. To compensate for centrifugal forces as Acela Express rounds curves, its passenger cars are able to tilt the passenger spaces to enable the train to round the curves at higher speeds than would otherwise be comfortable for passengers. In effect, the cars “lean into” the curves, just as a running athlete leans when making a sudden change of direction. Although the cars were designed to be able to tilt by as much as 6.8º, the adjacent set of tracks is too close to permit this without risk of collision with trains on those tracks. The maximum tilt is therefore set at 4.2º, which, in turn, reduces the maximum speed consistent with passenger comfort that the trains can attain on curves. The technical debt manifested in the tracks Acela Express uses thus prevents it from offering a service that would be more competitive with alternative transport modes, especially airlines. Note: In August 2016, Amtrak announced that it will be upgrading its trainsets and tracks to exploit new technologies, including active tilt technologies. All existing trainsets are due to be replaced in 2021-22. [Maloney 2000] Brenna Maloney and Don Phillips. “All Aboard AMTRAK’s Acela,” The Washington Post , November 30, 2000. Available: here; Retrieved April 18, 2017.